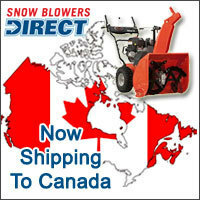 Snow Blowers Direct Now Shipping to Canada. Online Superstore Expands Distribution Internationally. They also appreciate that we collect and remit all taxes for them. SnowBlowersDirect.com- an online superstore specializing exclusively in snow blowers -- is now shipping snow blowers into Canada. "It sounds like a no-brainer, but shipping internationally is more complicated than you think," said Jon Hoch, founder and CEO of Power Equipment Direct, Inc. - the parent company of SnowBlowersDirect.com. The ecommerce store spent several months modifying its web site and shopping cart to accommodate Canadian customers. According to Hoch, the biggest challenge was providing customers with accurate, real-time quotes before setting up an account. Now, Canadians simply select their country and province in the shopping cart to obtain a quote, including GST and PST taxes, duties, brokerage fees and shipping costs. "We removed all of the guesswork, so there are no surprises later during checkout," said Hoch. SnowBlowersDirect.com already shipped more than a dozen snowblowers to Canada, and early results have been positive. "Our initial customers were extremely pleased with the ease of ordering," said Hoch. "They also appreciate that we collect and remit all taxes for them." The company plans to continue monitoring their new Canadian distribution system before launching the service on the company's other web stores. Power Equipment Direct operates nine niche online superstores. In addition to SnowBlowersDirect.com, the Bolingbrook, IL-based company operates AirCompressorsDirect.com, ElectricGeneratorsDirect.com, PressureWashersDirect.com, MowersDirect.com, WaterPumpsDirect.com, SumpPumpsDirect.com, ChainSawsDirect.com and LogSplittersDirect.com.